Our in-office, same-day procedures will alleviate your hip pain regardless of the cause. If you suffer with the Following Hip Conditions; learn more about how Regenerative Cell Therapy can help restore your health and help you live Pain-Free! Hip pain is a common problem that affects many people making it difficult to walk, stand and sit. Hip pain has many causes making essential to be evaluated properly to find the true cause. There are many conditions that can cause hip pain, including osteroarthritis, bursitis, tendonitis, and osteonecrosis. Blue Diamond Physical Medicine’s doctors have extensive experience when it comes to hip pain treatment. We have pioneered the industry’s latest proven alternatives to surgery and steroids. Our in-office, same-day procedures will alleviate your hip pain regardless of the cause. Our revolutionary platelet rich plasma (PRP) and regenerative cell procedures treat all the damage and underlying conditions that cause you pain. Our surgeons use amniotic regenerative cell therapy to rebuild and strengthen the damaged tissue of your hip, eliminating your pain and improving your quality of life. Labrum tear is caused in many different ways. Sports injuries are the main cause of labrum tears. The reason is, the outermost part of the labrum attaches directly to the tendon. So the athletes who use a lot of force and motion such as weightlifters, golfers and baseball pitchers are at high risk of this type of injury. Traumatic injury is the most common cause of a tear. Traumatic injury may result from a situation such as falling in a manner that puts strain on the hip or a direct blow or sudden pull. Furthermore, labrum tear can result from degradation of the cartilage from overuse, repetitive motion and a dislocated hip. If you are suffering from labrum tear, you can visit us for a painless alternative to cortisone injections and/or surgery. After undergoing our procedure it will take you a very short time to recover. Blue Diamond Physical Medicine’s procedure for labrum tears includes amniotic regenerative cell therapy. This procedure reduces the risk associated with traditional surgery and treats the underlying damage causing the pain. These cells accelerate the healing process by making the conditions in the affected area more conducive to repair and stimulating the movement of regenerative cells towards the site of inflammation. Osteoarthritis of the hip results from years of wear and tear. 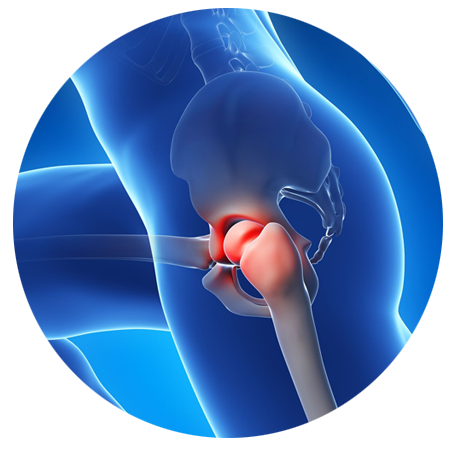 Cartilage provides a buffer in the joint between the bones to allow smooth, easy movement. Over time, this cartilage begins to break down and become brittle. Without enough cartilage to protect the bones from rubbing together and causing damage, this friction leads to swelling and painful inflammation. Ultimately, stiffness and soreness can limit mobility, and make moving the joint very painful. Traditionally, hip pain has been difficult to treat, with pain medications, steroid injections, or even surgery being the best possible treatment options. Fortunately, recent developments in technology and medicine make it possible to treat osteoarthritis pain naturally. Amniotic Regenerative Cell Therapy cells are powerful healing agents that, when used in concentrated doses, can quickly reduce inflammation and scar tissue, and enhance the natural healing processes of the body. Regenerative Cell Therapy is a non-invasive, in-office procedure that safely and effectively alleviates osteoarthritis pain. The hips are often the most used joint in the body, and over time take a lot of wear and tear. Hip degeneration is a condition that usually develops and worsens over a long period of time, and with the aging process. Some may not notice any symptoms in the first stages, and then may appear suddenly. When the cartilage protecting and surrounding the hip bones begins to wear down, those bones can begin to rub together. This friction between the bones eventually causes severe pain, inflammation, and swelling. It may cause stiffness, limit the joint’s range of motion, or even lead to the development of bone spurs. Advanced developments in regenerative medicine now make it possible to effectively treat pain from hip degeneration without prescription medications or steroid injections. In many cases, it may even help some sufferers avoid high-risk surgeries. Procedures like Amniotic Regenerative Cell Therapy take amniotic cells, and use them to heal specific areas of damaged tissue. When inflammation and aging slows down the natural production of these cells, providing the body with them in concentrated levels, quickly reduces pain, inflammation, and scar tissue. This process provides support for the immune system to help heal damage and degeneration within the hip joint. Inside the larger joints of the body are small, fluid-filled sacs called bursae that provide cushioning between muscles, bones and tissues, allowing them to move smoothly without friction. Bursitis is a condition involving the inflammation of one or more of these bursae. It can occur within the hip joints, causing mild to severe pain and stiffness, while making movement uncomfortable. Treatment for bursitis should first reduce the inflammation that is causing the pain and stiffness in the hip joint. Amniotic Regenerative Cell Therapy is one of our advanced treatment options that takes concentrated amounts of healing, and uses them to treat the specific area of inflammation and damage. Amniotic Regenerative Cell Therapy is a revolutionary solution to heal degeneration of soft joint tissues, and a safe alternative to medications, steroid injections, and surgery. This is a non-surgical procedure that can be done in-office to quickly and naturally alleviate your hip pain. If you’re suffering with Chronic Hip pain, find out if you are a good candidate for Regenerative Cell Therapy. Schedule your free consultation with our specialists today! Blue Diamond Physical Medicine offers regenerative treatments and non-invasive medical procedures for a wide range of medical conditions, including chronic pain and joint injury.